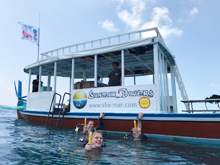 The dive center at Maamigili in the Ari Atoll ist the 1. Maledivian island providing highest safety to the divers! The enthusiastic reacions of the divers have been prompt. 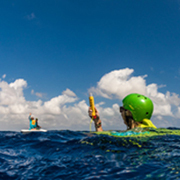 The name "Odyssey" of this project is a precise term because it's planned to go from the Azores to the European continent on the kiteboard! 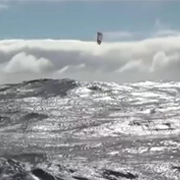 Anke Brandt and Francisco Lufinha want to kite 1500 km across the Atlantic, from the Azores to the Portuguese mainland. For their safety they rely on MOBOS. It may take 5-10 days, non-stop. To make sure that they are always in the eyes of the crew - especially at bad visibility - they use MOBOS. Industrial Award 2017: ENOS among the Best! Regularly international dive centers confirm that ENOS is the best diver rescue system of the world. Since April 2017 a further approval has been received by the Industrial Award 2017, which honoured especially ENOS-Beacon ETX. The Jury of the Industrial Award 2017 was impressed of ENOS-Beacon performances due to several reasons making it seriously unique. 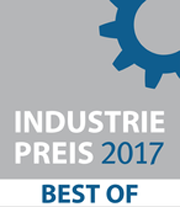 MOBOS-Receiver MRX-BT awarded by the jury in the competition of the German Industrial Award 2016 in the category "Electrical Engineering"
Rösrath/Hannover – What a pleasure for Seareq: the portable MOBOS-Receiver MRX-BT is nominated for the German Industrial Award 2016 in the category electrical engineering. This kind of MOBOS-Receiver is implemented in a splashwater proof case which receives the alert and forwards the alarm to a Tablet PC via Bluetooth technology. Just with a handy Tablet in hands it's easier to watch out for the casualty. 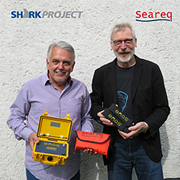 Rösrath/Offenbach – At "boot" Seareq has announced to sponsor Sharkproject with ENOS-SYSTEM. 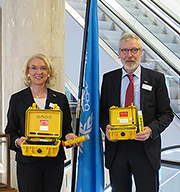 Now, the diver locating system was handed over. The well-known shark protection organization operate worldwide to draw the attention on extinction of sharks. There are many varieties to show the public the danger for the world and human race when sharks die off: puppet theaters for kids, a wide range of books, calendar etc., educational workshops and campaigns to enlighten governments. 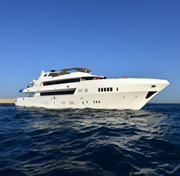 DAN (Divers Alert Network) Europe is going to include the ENOS-System into its HIRA Safety Standards (Hazard Identification Risk Assessment).